The Audi Q7 can be accused of many things, but following the heard is not one of them. So when Audi decided it was time to join the growing plug-in hybrid market perhaps we shouldn’t have been too surprised that they choose to ignore the industry standard formula of mating a petrol engine with the sparky bits and instead raided the diesel parts bin. But does it make any sense? Well the first thing to say is that diesel does still make sense if you are talking about big heavy cars and if you can mitigate the diesel emissions in populated areas. We know from experience that when other plug-in SUV’s revert to petrol power the fuel consumption is eye watering so they make most sense when the majority of your journeys are electrically powered and make less sense if most of your journeys are petrol powered. If your mix of driving is more, well, mixed then the Q7 does make sense. Officially the e-tron is well suited to this brief, providing up to 34 miles of electric only range it should keep diesel running in town to a minimum. However in practice you are more likely to get around 19 – 25 miles before it reverts to hybrid operation. When it does the diesel lump in question is a 3 litre which guarantees brisk performance. The good news is that the slimline electric motor which lives in between the 8 speed auto ‘box and the engine is also more than up to the task so you don’t feel short changed when it is doing all the work and you still get Quattro four wheel drive regardless of diesel, electric, or combined power. In fact as is usually the case with plug-in hybrids the Q7 is at its best in pure electric mode where it delivers smooth and effortless performance with the minimum of fuss. Of course the competition also impress in electric mode but the real ace card is the fuel consumption in hybrid mode. We achieved 40 mpg over 330 miles of hybrid motorway running when we would expect around 25-30 mpg for a petrol plug-in SUV. It is a significant difference that underlines the point that when you are dealing with 2.5 tonnes +, the efficiency advantage of diesel is noticeable. The inclusion of a diesel lump may not be particularly on message but in this case it is justifiable as it is paired with a useable electric only range so there is little excuse for diesel running in built up areas. 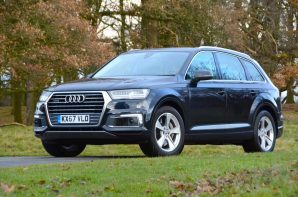 Of course physics does have the final word and there is no getting away from the fact that this is not an efficient car, using more electricity and diesel than smaller choices, but if you need something Q7 sized and you regularly exceed the electric only range it is a sensible choice.